In this guide we’ll take a look at the best low cost garden shed heaters. Reasonable economical to buy and run. This Dimplex OFRC15N 1.5 KW Oil Free Radiator Heater is a safe, economical and efficient way to keep a room, shed, conservatory or workshop warm and cosy. Within this list of low cost garden shed heaters, this is a clear winner! The radiator uses 1.5 KW and provides steady heat, ideal for keeping a building warm all day long. It is light and easy to move around so you can use it in a variety of locations whenever you need a bit of extra warmth. The easy glide castors also make it easy to move around a room. The radiator has two heat settings and a thermostat with frost setting, so this can be used to keep a shed or greenhouse frost free in the colder months. It takes about 15-20 minutes to take a room or shed from chilly to toasty. Because it is oil free you don’t have to worry about leaks or smells, and it is also 25% cheaper to run than an oil filled radiator. This also makes the item kinder on the environment. The radiator is economical to run, especially when compared to a fan heater, which means you can use it all day without worrying too much about the cost. I have found it ideal for heating one room in the home, such as an office, without needing to have the heating on in the whole house all day. It would also be perfect if you spend long periods in an outdoor office or workshop. This heater provides a perfect low-cost solution that is ideal for providing all-day warmth in the home or any outbuilding. It is easy and safe to use, does the job well and offers great value for money. It’s the best shed heater for the UK market. This Chefavor Portable Fan Heater is compact enough for use in even a small shed or room but provides a lot of heat for its size. Its small, stylish design means it would look great in a conservatory, sun room or porch as well as being useful for outbuildings such as sheds and home offices. The fan features a powerful 950-Watt high heat setting and a 700-Watt low heat setting as well as a fan only setting, making this a versatile product that is useful for heating in winter and as a fan in summer. It also oscillates to spread heat evenly around the room but can an also be fixed to direct heat to a specific area. The heater features an LED indicator so you can see at a glance what setting it is on. The fan has several safety features including automatic shut off if it overheats or is tipped over. It is a little bit noisy on the high setting, but on the low setting, it is very quiet. This ceramic fan heater is reasonably cost effective to run and starts to warm the room the minute is turned on. On the high setting, it warms a room quickly and can then be turned down to low to maintain heat. Fan heaters are not the most economical way to heat rooms over long periods, however, they are ideal for a quick blast of heat to take the chill off a room. If the room you are heating is insulated then it will stay warm and you won’t have to leave the heater on for long anyway. This is a low cost garden shed heater that is ideal for taking the chill off a room. It would be suitable for rooms and outbuilding that are used occasionally for short periods or that are well insulated. I have found this the perfect solution for use in a chilly conservatory and its portability means it is handy to have around the home as an additional heat source for colder rooms. If you are asking ‘what will be the best heater for my shed?’ then you need to take a look at this particular mode. Overall this is a stylish and affordable solution to keeping the winter chill at bay. This Bio Green 2KW Palma Heater is suitable for outbuildings, greenhouses or in the home. It features a 2000-Watt heating output and a powerful fan that circulate the warm air at 163 m3/h. The IPX4 splash-proof rating means this is suitable for use in damp rooms such as greenhouses. The heater has a stylish and robust design that would look at home in the workshop or conservatory. It is also compact in design, has slip-proof feet and a carrying handle. The heater includes a digital thermostat so you can keep your shed, room or greenhouse at the perfect temperature. This means you don’t use more electricity than you need. The fan circulates the warm air quickly around the room to maintain an even temperature. The thermostat is very accurate and is ideal if you want to provide frost protection for plants or for items stored in a shed, garage or workshop. The thermostat can be set anywhere between -50C to + 99C. This is the perfect heater for plant enthusiasts as it can be accurately set to exactly the temperature you need, and it will maintain this. However, its stylish design means it will be equally at home in the sun room or conservatory. This energy efficient Ecoheater 1000mm Slimline Shed Heater provides ambient heat that is perfect for preventing freezing, condensation and damp. The heater provides an extremely low-cost solution for frost protection in greenhouses, cold frames, sheds, garages and workshops. It costs very little to run and provides just enough heat to keep buildings above freezing. This slimline heater is small and unobtrusive so can be tucked away in a conservatory or even the smallest of sheds and greenhouses. It can be wall mounted or used floor standing, however, I would recommend mounting it on the wall if you have children as it does get hot to the touch. Its IP44 rating means it is safe to use in damp buildings such as greenhouses. This heater has a thermostat that switches off the heater when the set temperature has been reached. It has an easy to set dial and an indicator light to show when it is on. I tested this heater in an unheated garage, and it kept the area at about 6 degrees even when the temperature outside dropped below freezing. This is the perfect solution for keeping greenhouses and sheds frost free and dry over the coldest winter months and it only costs a few pence per day to run. it’s definitely one of the best low cost garden shed heaters on the market. This Warmlite WL42005N Halogen Heater warms up a room fast and has three heat settings of 400, 800 and 1200 Watts. It also has an oscillation function to evenly heat a room. The item is portable and lightweight so can easily be moved to different locations as required. The heater has a safety cut out in the event or toppling or overheating. This product is also very energy efficient. In my opinion, this is not the most stylish design, however many people like the warm glow that it gives off. Replacement halogen bulbs are available separately. An excellent low cost garden shed heater that provides instant heat anywhere you need it. This Sunhouse 80W Low Energy Tubular Heater is another heater designed to provide ambient heat for frost protection, reducing damp and condensation. It has an adjustable thermostat and will quickly warm up a room to the temperature set and maintain that temperature continuously. The low cost garden shed heater is extremely economical to run and is the perfect solution for keeping outbuildings frost free. The splash-proof rating means it is suitable for use in damp areas such as greenhouses. When I tested this heater in an unheated garage it kept the temperature above freezing even on the coldest nights. And it only costs a few pence a day to run! If you do not have an electricity supply to your shed or greenhouse then obviously you cannot use an electric heater. However, this S&MC Gardenware Large Paraffin Cold Frame Heater provides a solution. This paraffin heater from S&MC Gardenware is stable, sturdy and simple to use. It is a good size and fits together well. It also comes with excellent instructions. 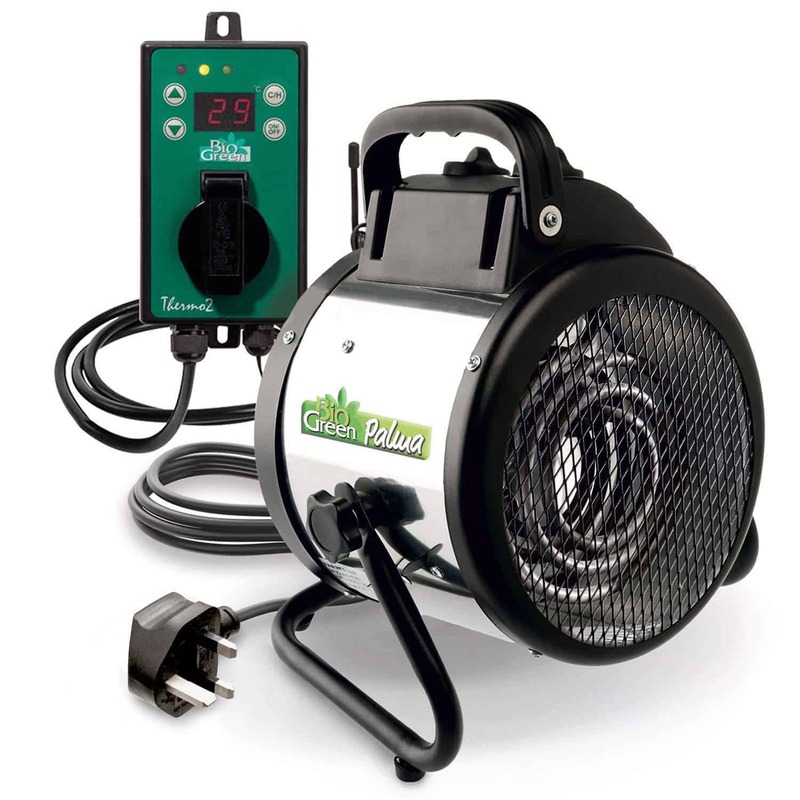 This paraffin heater is ideal for keeping greenhouses, cold frames and sheds frost free through the coldest months. The heater is filled with paraffin, placed on a level surface and the wick is lit and can be adjusted to the right level. The wick should be trimmed to perfectly horizontal for best results. Once filled with paraffin, which will cost around £5, it will keep burning for up to 14 days. This is a simple solution to creating ambient heat in a building with no electricity supply. Whether you use your shed as a home office, just like to pop in there to warm up after a cold morning’s gardening, or simply want to ensure plants, tools and paint don’t freeze, there are plenty of low cost garden shed heaters keep off the chill. There is a range of low cost garden shed heaters available for heating cold spots in your home such as sheds, garages, workshops, conservatories and greenhouses. The main ways to heat these spaces are with electric radiators, fan heaters, halogen heaters, tubular heaters or paraffin heaters. Many of these are very efficient and don’t cost too much to run. And the paraffin heaters allow you to heat a shed or greenhouse to keep it above freezing even if you don’t have an electricity supply to the building. If you are worried about the cost of heating an outbuilding, then you’ll be pleased to know that there are many cost-effective options available that take only pennies to run. Of course, for best results, you should also consider insulating your shed or outbuilding if you haven’t done so already. This will keep the precious heat in and keep your shed toasty without costing the earth. The right heating solution for your shed, outbuilding or greenhouse will depend on your building, the amount of heat you require, your power source and of course your budget. You may also want to consider the look of the heater, especially if you want to use it in a conservatory or sun room. Here’s a look at some of the options for low cost garden shed heaters. Electric radiators offer a simple solution to providing extra heat. Simply plug them in wherever you need them and away you go. Oil-free versions are more economical to run and more environmentally friendly than oil-filled types. Because they are quite low cost to run these heat sources are ideal if you want to warm a room up continuously over a long period. Some of them also have a frost-free setting so these are perfect for protecting plants in the greenhouse or tools and paints in the shed. Radiators provide a very safe way to heat a room so are particularly suitable if you have children or pets. Electric radiators are a safe, versatile and cost-effective way to provide heat in a variety of situations. Fan heaters provide instant heat and can warm up a room in minutes as well as circulating that warm air into every nook and cranny. However, they are more power hungry than other heat sources. This means they are more suitable for quick blasts of heat for short periods than keeping a room warm all day. Fan heaters have safety features that prevent them from overheating and ensure they cut out if they are knocked over. They also come in a range of stylish designs. Halogen heaters use halogen elements to provide heat. They may cost a little more to buy than other types of heater, however, they are sturdy and durable and cheap to run. They come with plenty of safety features to and will cut out if they are toppled over. The halogen bulbs may need to be replaced from time to time. If you simply want to keep a room or outbuilding frost free, then a low energy tube heater may be the perfect option. These are designed to provide ambient heat and protect rooms from frost, condensation and damp. If you need to keep your greenhouse, shed or garage frost free then these are a simple, low-cost solution. Paraffin heaters offer a simple solution to heating buildings with no electricity supply. They are cheap to buy, simple to use and reasonably cost-effective to run. Modern paraffin heaters are also safe to use, though you should follow all instructions and safety guidelines provided by the manufacturer carefully. Whatever heating solution you choose, you can get the best out of it and save money if you insulate your shed or outbuilding as much as possible. I need to keep my garage frost free to ensure my freezer and dehumidifier work properly. What type of heat source would you recommend? To keep an area frost free, the low energy tube heaters that are often sold as greenhouse heaters would be ideal. They cost very little to run and are safe and effective. They can be wall mounted or floor standing, and you can also buy protective metal housings for them which can be a good idea if they are in reach of little ones. What type of heater should I use to keep my rabbit house warm over winter? There are a couple of options that will work in this situation. The first is a low energy tube that will keep the room frost free. Most of these will keep a small shed at about 6 degrees even when the temperature outside is below freezing. Metal housings can be bought for these to make sure your pets can’t get too close to them as they get quite hot to the touch. The other option is an oil-free radiator with a frost-free setting which will also be safe and economical to run. Will the tools in my shed be damaged by freezing conditions over winter? Freezing damp conditions can have an adverse effect on a range of items in your shed. Paints can freeze, the metal parts of tools can rust, and plastic parts can become brittle. In addition, the grease and other lubricants in power tools can freeze. You only need to keep the shed just above freezing to prevent this damage so consider installing a heater that has a frost-free setting. In addition, allow any tools you use to warm up to room temperature before using them.